When you’re down to have some fun in the sun and catch a wave, you’ll need a surfboard that is suited to your needs. Surfboards need to be just the perfect length and weight to help you ride those waves, so we’ve put together surfboards with a variety of different lengths and types to give you the best experience possible. Before we get started, let’s take a look at some things you should know. 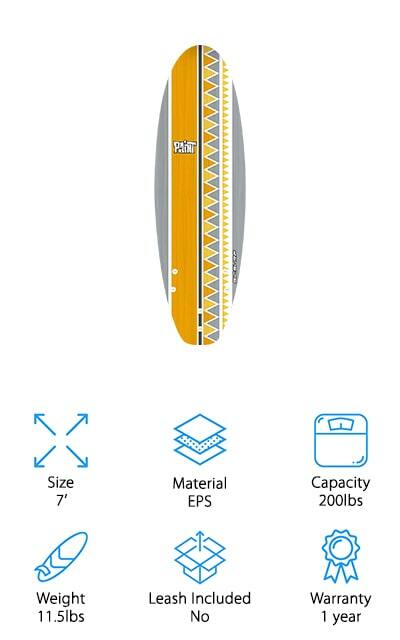 Size: This refers to the length of the surfboard. This is, of course, important for the type of surfing you’re going to be doing. Different waves require different board lengths, so keep an eye on this before you buy. Material: What is the board made of? The majority of the surfboards on this list are made of foam or EPS foam, which is higher-density so the board will be sturdier. This mainly refers to the core of the board. 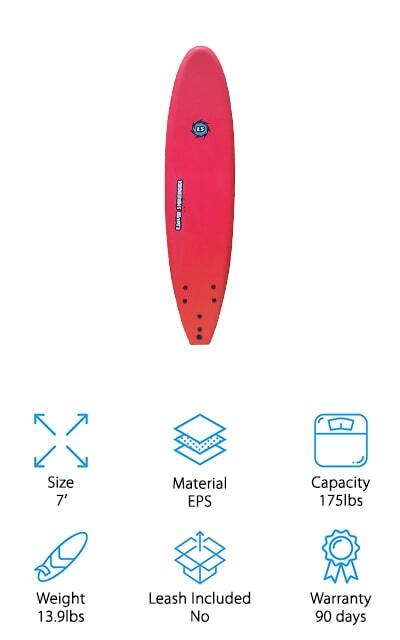 Capacity: The capacity of the board refers to how much it can carry, so this should be taken into account before you purchase a board. This is the maximum recommended weight before the board starts to sink. Weight: Weight, however, refers to how much the board itself weighs. Some are easier to transport than others, and if you’re going to be moving your board around frequently, you want a board that is fairly lightweight. Leash Included: The leash keeps the board from floating away from you when you wipe out or fall off of it. Everyone does it at some point! We’ll let you know if a leash is included with your purchase. Warranty: The warranty is a manufacturer’s way of telling you that they back up their product. If it breaks or stops working for any reason within this time frame, you can get a replacement or a refund. With that information under your belt, we can take a look at our soft top surfboard reviews! We’ve compiled the best surfboards we could find, with as much variety as possible so you can get out there and catch those waves. Our top pick and budget pick are highlights, so check those out first before moving through the rest of the list. We’re sure that you’re going to find the surfboard that’s perfect for you! SBBC makes one of the best all-around surfboards on our list. 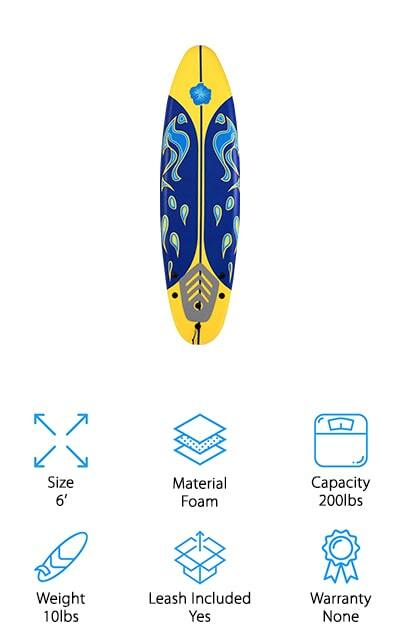 This surfboard has a core of dense EPS foam, with a form board top and diamond weave HDPE bottom. The top of the board is textured with a ‘fingerprint’ texture, which allows you to get a better grip on it with both your hands and feet. This board is a full seven feet long for catching all of those big waves. It even comes with a leash so that the board will stay with you. It’s a nice action board that even comes with plugs on the front so that you can mount a Go Pro or similar action camera. 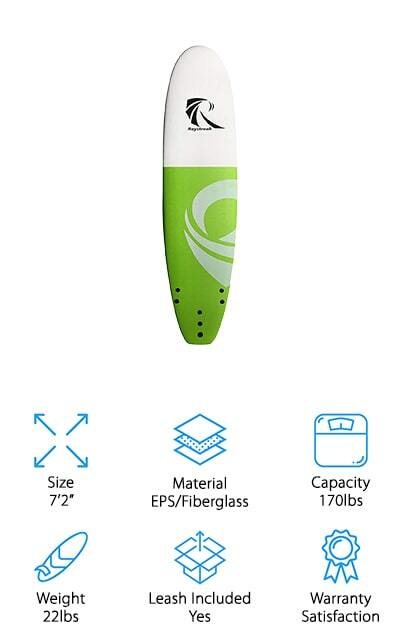 Get some cool shots while catching a wave with this board. It’s one of the best funboard surfboards that we found during our research, and that’s why it reached the top of our list. It’s great for any level of experience. Even beginners will have fun! This Giantex Foamie is one of the best starter surfboards we found. The top part of the board is made of foam, with a high-density EPS core and a hard, slick bottom that will help you ride those waves. The bottom will help maximize the speed of the board and make it a little more rigid. 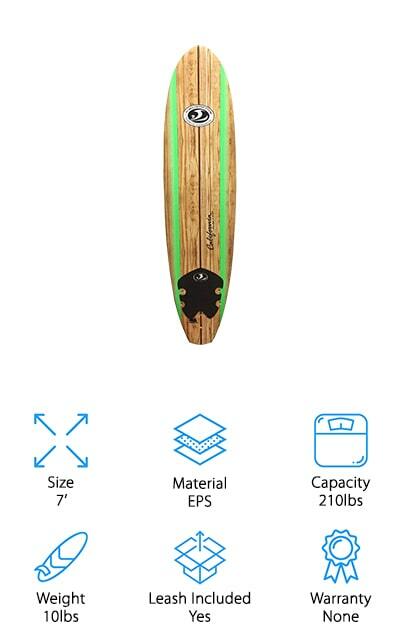 It’s a comfortable board that comes equipped with a free leash and a comfortable transaction pad that you’re going to love using. It’s one of the best surfboards for beginner to intermediate skill levels that you can get for someone just starting out, in part because it’s so lightweight. It’s 6 feet long, which is a nice intermediate length that just about anyone can use comfortably. It has a fishtail for more traction, and you can remove the fins when you transport the board. It comes with everything you need to get started, and we’re sure you’re going to love it. The Rock-It HOPE Surfboard has a beautiful diamond tail three-fin design that’s heavily inspired by retro surfboards. It’s great for the environment because it’s made with recycled EPS foam, with a fiberglass cloth under the soft top portion so that the board can stand up to more rigorous wave riding. We love that this board pulls so much of the technology from the hard, shorter surfboards of the ’70s and ’80s and put it into a foam longboard. It has more drive and grace than some of the other boards on our list, and the fins are a bit stiffer than other soft top fins. This board has an all-around amazing performance. It comes in a variety of colors, including yellow, green, orange, two different blue colors, red, and pink. You can customize the board however you want! It’s one of the best surfboards to learn on because of all the extra handling features, plus the great retro design. Keeper Sports makes this amazing California board. It’s extremely lightweight, with a deck that’s made of EPS foam and a polyethylene bottom to help you glide over the waves. It has a traction pad to help you grip onto it, and comes with a surf leash so that it won’t float away on you. The top has a woodgrain graphics effect that makes it look as though the board itself is made of wood, which is a beautiful aesthetic. It has a great price as well, so it’s one of the best beginner surfboards on our list. If you aren’t sure if you’re going to love it, this longboard is a great place to get started and find out if you will. It comes with three fins and the leash. 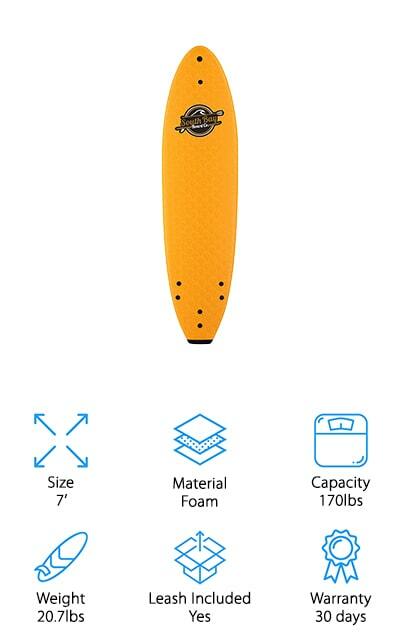 It looks like a wooden board, but it actually has a soft foam top with a texture that will keep you on your feet! It’s a great starter board. This surfboard by Liquid Shredder works well for all levels of expertise. It’s the best soft top surfboard that we found to work for both beginner and intermediate riders. It will stick with you for a while after you learn to ride, as well! This board is 7 feet long, with an EPS core and EPE deck. This deck is colorful and feels soft, though when it’s wet it adopts an anti-slip texture so your feet will stay right where you want them to. This is especially helpful when you’re still learning! The bottom is made of white polypropylene that helps to add rigidity to the board but also helps it glide over waves effortlessly. These three layers are heat-laminated together, which is what makes the price point on this surfboard so righteous. It even has wooden stringers to help keep it stiff and comfortable. This board can hold up to 175 pounds, or 140 for beginning riders! We’ve found one of the best surfboards for beginners, child-sized and all! This 5-foot 10-inch surfboard is the perfect size for children that are beginning to learn to surf. It only weighs six pounds, so they can easily carry it themselves as well. It comes with twin fins for stability, as well as an ankle leash and stainless steel swivels. This board isn’t going to get away from you as you’re learning to ride it! This board focuses on making riding as smooth and easy as possible, with a board that’s built for stability rather than speed. It even comes with two fins. The EPS core is durable, so this board will serve you through plenty of surfing adventures. The bottom is made of slick, heat-laminated HDPE that helps to make it sturdy, and a sealed deck so it always looks great! Because of its size, it doubles as the best small-wave surfboard that we could find during our research! This Dura-Tec board by BIC Sport gives you a sturdy board at a great value! It’s got all of the stability of a longboard with the maneuverability of a much smaller board, making this one versatile piece of equipment. It’s so durable that it’s bullet-proof, so you know that you’re going to get the most out of your money with a board that won’t wear down easily. It has an integrated 3D traction pad for staying on top of things (quite literally). It’s got a modern shape that makes it easy to ride, and the high-quality materials will make sure that it stays that way. This board is going to last you forever, and you’re definitely going to love riding it. While it’s great for beginner surfers, it’s definitely the best surfboard for intermediate riding that we could find. You’re paying for amazing quality with this board, and it will easily last twice as long as other boards. California Board Company is back on our list again with this 8-foot surfboard. 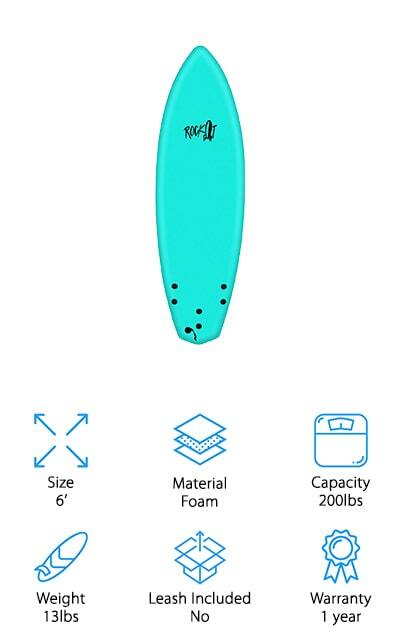 This board looks like it’s made of wood because of the graphic all the way around, but it’s actually made of a high-density EPS foam that makes it float better while also making it easier to carry around with you. At only 12 pounds, this board is definitely not as heavy as it works. The EPS is so dense that it’s completely waterproof – nothing is getting into this surfboard. 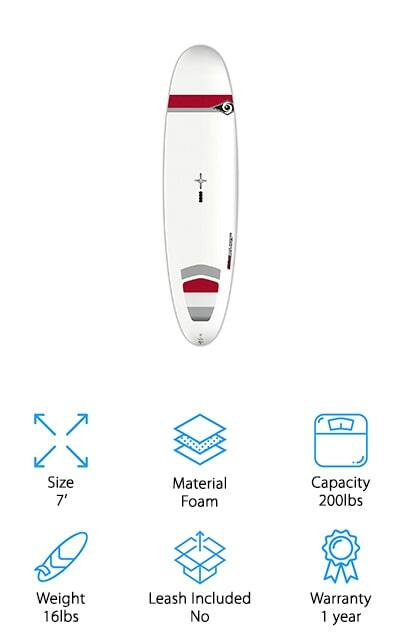 It comes with three fins to help give you the most control and air that you can get out of a surfboard, paired with a Polyethylene bottom. It’s slick and you’ll get a ton of speed out of it. This board is great for people who are more experienced in surfing, and it’s also one of the longest that we found. If you need a durable longboard, this is the one for you! The RAYSTREAK 7-foot model comes in four beautiful colors, including blue, green, pink, and red. There’s a color for everyone. This surfboard can support riders up to 170 pounds – it’s great for beginners and intermediate riders alike! The internal core is fiberglassed for added stability, with strong EPS foam and a hot-press skin on top. This top layer is what RAYSTREAK calls Crocskin. It’s a non-slip, anti-scratch surface that isn’t slippery. It has a nice texture so that you can grab onto the board and ride those waves. The heat press also helps the graphic endure, even after long days of shredding on the slick, HDPE-coated bottom. It comes with a satisfaction guarantee that you’re going to love the board and that it will be durable for all of your surfing needs. If not, they give you your money back. They really stand behind their product, and after surfing with it we know you will too. The Paint series by BIC is full of durable, colorful surfboards that are easy to ride. Whether you’re just getting started or you’ve been around a while, this is the board that you should consider getting. 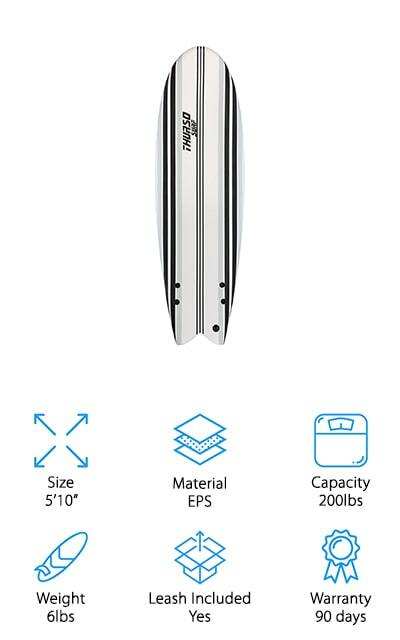 This is just the 7-foot version: they have lengths for every type of surfing and riding proficiency, so check into it to get the right one for you. The three models are the 4’11” Twin Fin, the 5’6”-6’6” shortboard, this 7’ magnum, and the 8’ super magnum. They come in a variety of cool colors and patterns, and there’s even a low-profile carrying handle along the edge of the board for easy transport. At 11 pounds, it’s not like this board is hard to carry around, but the handle definitely helps. It’s got an EPS core with a fiberglass deck and bottom that will make gripping and riding easy, while still being sturdy! You’re going to love this board!